Robert Chapman Davie was born in Lisbon in October 1886, but moved to Glasgow and was schooled there at the Glasgow High School, before going to the University of Glasgow in 1904, where he graduated with a first class honours M.A. in English. This degree included some scientific courses, including one on Elementary Botany taken in 1905, and Davie found himself drawn more to that subject than English, so went on to pursue this by enrolling for another degree, a BSc. in Botany, Chemistry, Zoology and Geology, graduating in 1909 after winning the Dobbie-Smith gold medal for Botany along the way. He stayed at the University of Glasgow, becoming an assistant in the Botany Department before moving to the University of Edinburgh in 1912 to become a Botany lecturer under RBGE Regius Keeper and Professor of Botany, Isaac Bayley Balfour. Davie was given special charge of the large Teachers in Training classes and lectured on hepatics (liverworts) and mosses to Edinburgh University Botany students at the Garden. 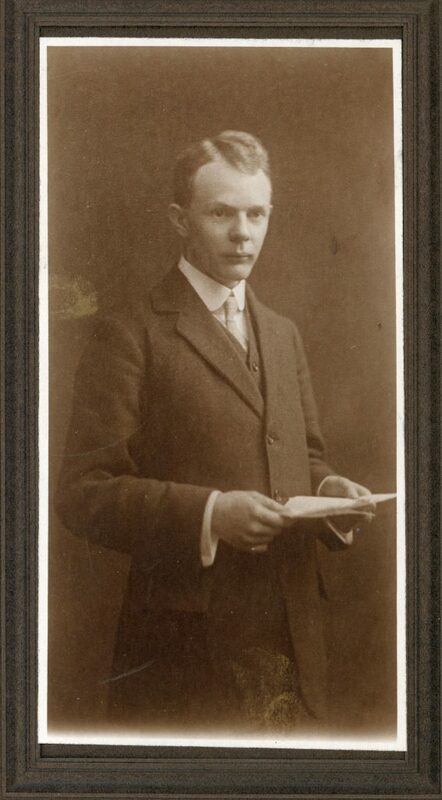 He carried on with his own studies throughout his teaching career, and soon had enough material to research a doctoral thesis on the subject of pinna-trace in ferns, and he completed this at the University of Glasgow, graduating with a DSc in April 1915 whilst still teaching and working at Edinburgh. 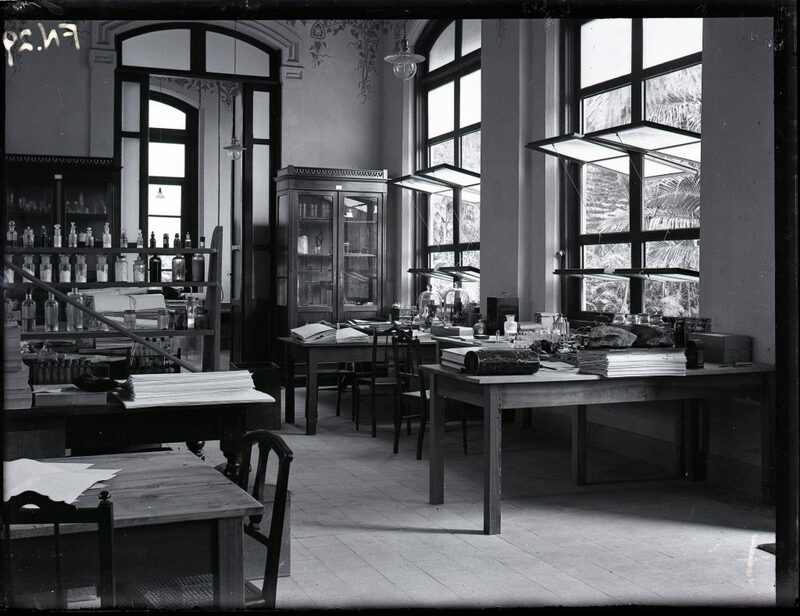 Davie’s photograph of the laboratory at the Jardim Botanico, Rio de Janeiro in 1914 – could that be his vasculum (collecting tin) and herbarium specimens being pressed on the bench on the right? 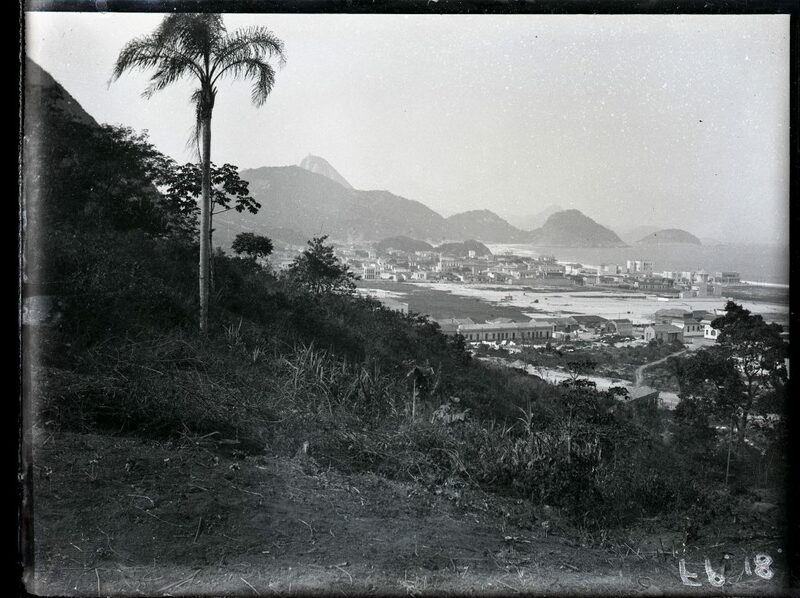 Davie’s research was interrupted in 1914, not by the war at first, but when he obtained a grant from the Royal Society to travel to Brazil to research comparisons between flowering plants. 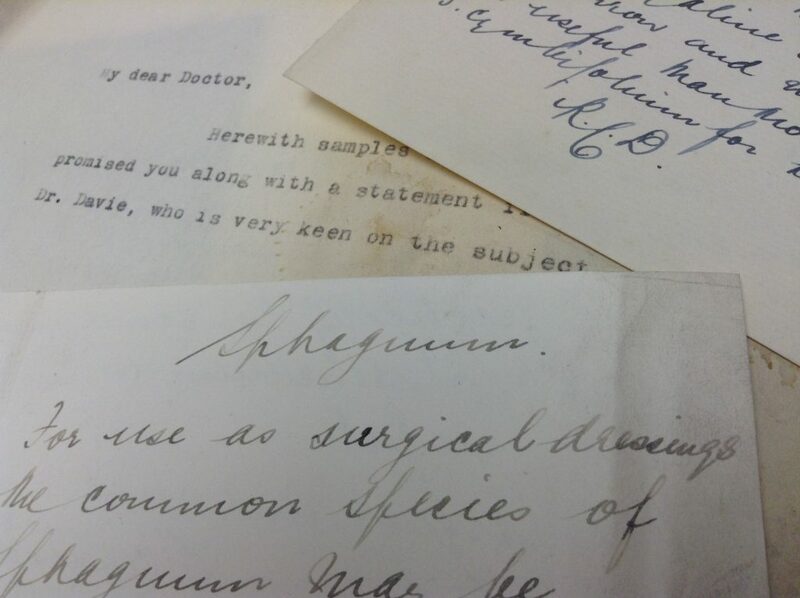 He was still working on the material he collected there when the call to join the military service finally came in 1917.
this RBGE Herbarium specimen appears to have Davie’s notes and sketches on it. Due to effects of ill health when he was younger, it was known that Davie would not have been fit for a role in a combative branch in the army, and this may be why he wasn’t called upon to enter service until 1917, despite him apparently offering his services when war broke out. Another reason may be that his specialism in mosses meant that he was heavily involved in the work RBGE was doing in offering specialist advice to those engaged in collecting sphagnum moss to aid the war effort – the moss was used as an alternative to cotton in making would dressings, it being highly absorbent and antiseptic too. Finally though, in 1917 he was enlisted to the Royal Army Medical Corps, to a role which took full advantage of his scientific training – a Lieutenant, later promoted to Captain, and Senior Chemist in the 4th Water Tank Company, providing clean and sterile water to the troops on the Front Line, a vital and often forgotten service. He was in France with his unit during the German’s Spring Offensive, and the subsequent Allied advance in the last months of the war. mentions of Davie being ‘very keen’ on the subject, his notes and initials. After the Armistice, in January 1919, Davie was granted some leave to return home to Largs to visit his wife and infant daughter who was born in 1917, and it was whilst he was there he succumbed to influenza, (possibly the Spanish Flu?) which turned to pneumonia with fatal effect; he died at home on the 4th February 1919 at the age of 32. 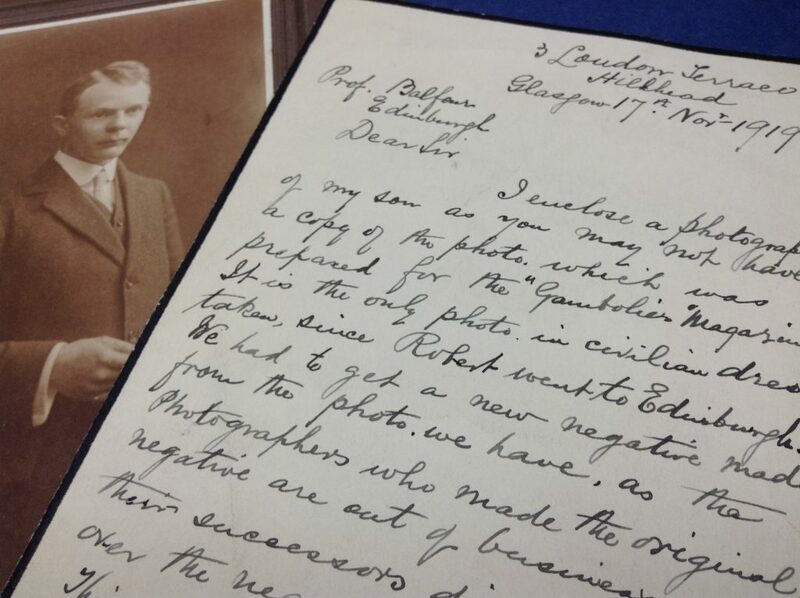 Letter from Davie’s father Robert to Isaac Bayley Balfour, sending a copy of a photograph of his son, “the only photo in civilian dress taken, since Robert went to Edinburgh”. Davie had already made his mark as a teacher, an investigator, and an organiser in Botany. An easy diction, with unusual command of his native tongue, gave him a good footing as a Lecturer … and an early promotion to Professorial rank was anticipated for him. A quickness of apprehension of facts and comparisons, good powers of observation, a lively imagination and a very retentive memory gave him a hold as an investigator, which a judgement ripening with age would have strengthened and directed into useful channels. As an organiser, his departmental work was marked by a cheerful efficiency. His stimulating influence was shown in the part he took in founding the Glasgow University Botanical Society. In a wider sphere his activity as one of the Secretaries of the Botanical Section of the British Association had already brought him in the relation with the great body of British Botanists. At the age of 32 he had fully qualified for years of active usefulness. It is this which makes his early death all the more lamentable. Time and opportunity were against him. So that at the moment of his death he was of the Front rather than actually at the Front, both in Science and in War. 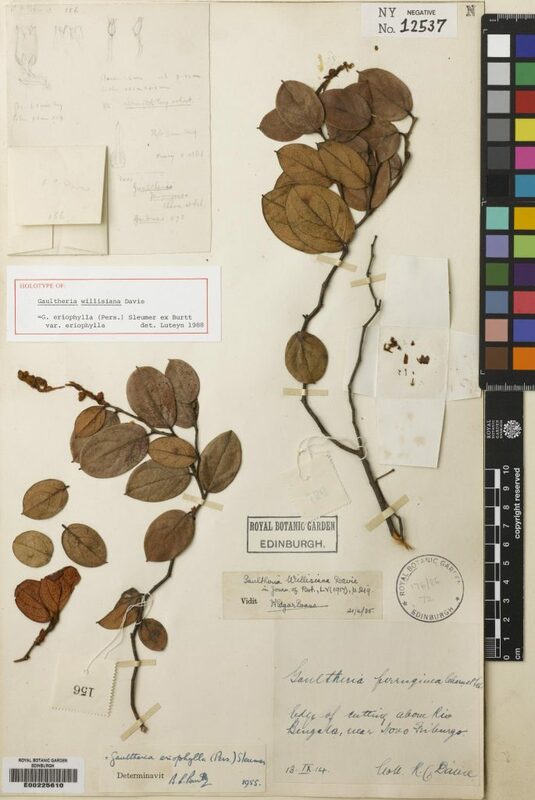 Details and images of some of Davie’s Brazilian and Scottish herbarium specimens can be found on the online RBGE Herbarium Catalogue. the Glasgow Herald and by the University of Glasgow. Interesting article about an exceptional man. Sad to see such promise lost at an early age. His obituary, so well written by FO Bower, brings to life his fine character a century on. So graciously articulate the people of The Great War era were.